HomeNCAAFootballWho leaked Leo Lewis transcript to Steven Godfrey? Who leaked Leo Lewis transcript to Steven Godfrey? Leak of NCAA case information could have unintended consequences for Ole Miss. Everybody is discussing the information that was leaked to Steven Godfrey regarding the testimony of Leo Lewis before the NCAA Enforcement staff. I highly suggest you read the article. 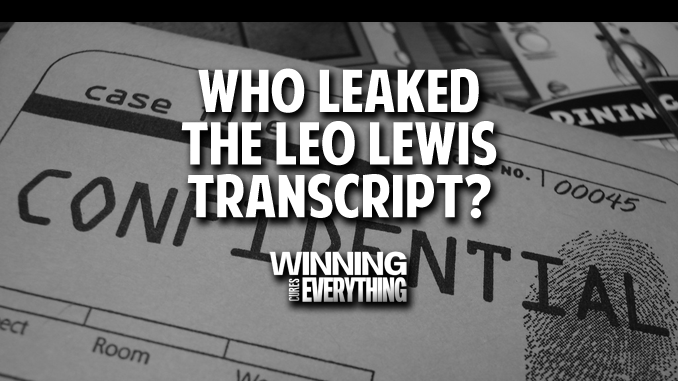 As good as the article is, discussions have sidestepped the fact that the information used as the base of the article (Leo Lewis’s testimony transcripts from NCAA interviews) is considered confidential information. What does this leak mean? We assume the goal of the information leak was to paint the NCAA in a bad light. But if you’re fighting the NCAA, who holds all of the power in this case, why would anyone attempt to embarrass them, from the Ole Miss side, when the school is hoping for leniency in the case? Remember, the NCAA is not a court of law. They are the judge and jury. Nothing was leaked to which the COI does not already have access. Where did Godfrey get his information? I have heard from several people across social media that Godfrey had to get his information directly from the NCAA. The reason for that thought process is that one of the Ole Miss administration’s biggest issues was that they did not have access to Lewis’s testimony. Sources tell me people involved in the case have had this testimony dating back to, at least, March. If nobody had access, then how would Rebel Rags have been able to go forward with their lawsuit? Without actual proof of statements made by the people they filed against, there would be no case. So where did Godfrey get his information? First, here is Steven Godfrey’s bio at SBNation. One Ole Miss source tells Steven Godfrey they believe only five of the 32 are alleged football violations, and that coaches are “confident” allegations related to the current staff are secondary violations. Now, this is not to say Godfrey’s information is not accurate. That Jan 29th article, and his source, were proven incorrect (hence why we have the Houston Nutt lawsuit against the school), but I’m confident that the information he used in this most recent article is factual. The issue here is that his source leaked information that is confidential to the NCAA case. What is confidential NCAA information? The NCAA makes people sign waivers agreeing to not divulge or share information with parties not involved with the case. You do not receive a login to this portal unless you sign the agreement. Nobody is supposed to have access to these case files unless they are involved in the case. The NCAA online portal that contains this information is setup where you cannot print or e-mail these documents. A person would have to make photographs or take notes on these transcripts, or just be given a login to the NCAA portal, which is reserved for individuals involved with the case. What is the punishment for leaking confidential documents? In an actual court of law, if documents or information are released that are confidential, or under a “gag order,” the leaking of that information is contempt, which is punishable by fine or jail time. The NCAA is not an actual court of law, but the leaking of these transcripts is a flagrant disregard for the NCAA process, and I doubt the COI takes it kindly. Per sources, the confidentiality waiver is very specific and firm. The NCAA can pursue harsh criminal charges against anyone that breached the agreement. Godfrey is not in trouble. As a journalist, Godfrey is not required to reveal his source. The question is, does the NCAA have a way of tracking, through the portal, who pulled up the information prior to the article being released, and then question those individuals? If no evidence is found to link anyone specific to the contract breach, the NCAA could claim there is sufficient proof that somebody involved with the school breached the confidentiality agreement, and the school would, in turn, be held accountable. This action seems to be just another in a string of several that indicates the string pullers at Ole Miss are unconcerned with what next happens to the school. The downside risk may never be known as the NCAA will never reveal the details of the COI decision and, unlike this information, the backfire of any of the actions will never be leaked by the University.